“European institutions should safeguard the right to free, independent and pluralistic information”. 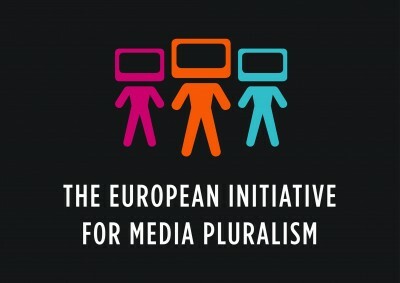 The quote, from the Media Initiative website, summarizes the main idea behind a pan-European campaign that aims at urging the European Commission to draft a Directive to protect Media Pluralism and Press Freedom. Alexey Navalny and his amazing netizen deductions. 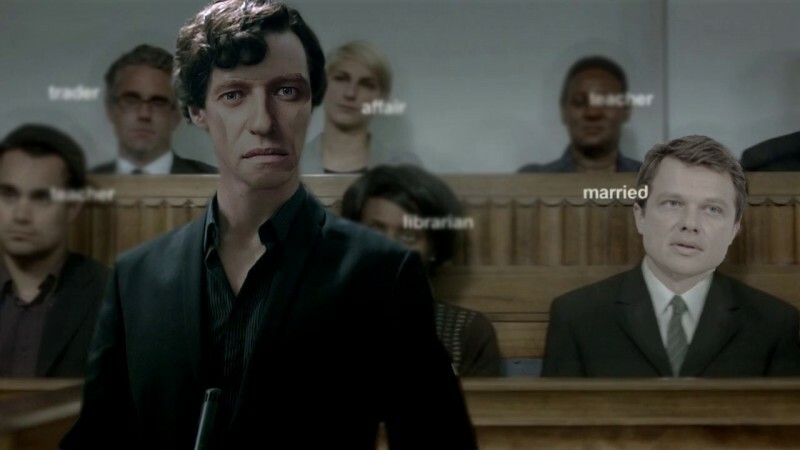 Navalny depicted as Sherlock Holmes, left, and Maxim Liksutov, right. Images mixed by Kevin Rothrock. Russia’s leading anti-corruption blogger, Alexey Navalny, is making waves again with his latest online work [ru], a series of allegations against Maxim Liksutov [ru], the multimillionaire head of Moscow’s department of transportation and traffic. Navalny surfaced shareholder records indicating that Liksutov sold his stocks to his wife in an attempt to circumvent a federal law against owning foreign assets. Navalny also alleges that some of the Liksutovs’ assets, such as Transgroup Invest AS, are the parent companies of several transportation-related interests, creating a conflict of interest. Liksutov denies violating any laws, pointing out that he and his wife divorced on June 26, 2013, which the Moscow mayor’s office now confirms. Maxim Katz, a transportation guru and frequent consultant for the city of Moscow, has responded [ru] with some hostility to Navalny’s accusations against Liksutov. Curiously, Katz was also Navalny’s mayoral campaign manager last autumn, giving him work experience with both men. In a LiveJournal post on January 16, 2014, Katz denied any loyalty to Liksutov, but said he wasn’t yet convinced of Navalny’s allegations. Insisting that the law in question is “idiotic,” Katz dismissed the Liksutovs’ various stockholder maneuvers. =>… только в конфликте интересов. Ну, и еще в Госдуме, которая принимает такие законы, что людям приходится разводиться. If I’m being honest, I don’t see anything wrong in our state officials owning foreign accounts, stocks, or houses. Liksutov’s problem is only with conflicts of interest. And there’s a problem in the Duma, which adopts these laws that force people to divorce. On the question of conflicts of interest (which Navalny now emphasizes, too, given the revelation about the divorce), Katz acknowledges that such corruption would be grounds for Liksutov’s dismissal, but says the record shows Liksutov has not awarded his own firms any suspicious contracts. Indeed, one of Liksutov’s assets, Transmashholding, did submit a tender [ru] to produce streetcars for the city of Moscow in December 2012, but it lost to another bidder. While Navalny and his LiveJournal account are certainly responsible for putting Liksutov in the news this week (possibly leading to his future termination in the transportation department), trouble for the multimillionaire has been brewing for months. In late September 2013, Estonian journalists named Liksutov’s wife, Tatiana, the richest woman in Estonia, where Transgroup Invest AS is based. The incident drew some attention to the couple’s stock transfer, when no one at the time claimed the two had divorced. In fact, on September 30, 2013, Russian political analyst Alexander Pozhalov even observed in a Facebook post [ru] that the Estonians’ announcement should press Russian journalists to study whether Liksutov had broken any laws. Until this week, Liksutov had slipped under the radar. But, as anyone in Russia knows, where the media fails to report on corrupt state officials, Alexey Navalny is bound to go. Portuguese filmmaker André Soares published a short video documentary about the Struga Poetry Evenings, an international poetry festival that has been held annually for half a century, since 1962, in the town of Struga, Macedonia (the official site). The film features statements by poets Vladimir Martinovski from Macedonia, a Chinese exile Bei Ling, Rati Saxena from India, Corey Marks from the United States, Siim Kera from Estonia, Mimoza Sali from Albania…who also talked about the global situation with poetry and read their works in various languages. The festival is one of the crucial elements of the official, state-supported culture, and its opening is usually attended by top political personages, like the Minister of Culture, Prime Minister and/or the President. As such, it has not proven conducive to promotion of domestic dissent, as attested by the critical post [mk] on the 2009 edition by activist blogger and poet Vnukot. In 2011, he specifically returned [mk] to publicly read his poem about the murder of Martin Neshkovski, the event that incited the grassroots protests against police brutality a year ago. Over the years, Macedonian bloggers have been mentioning the festival by quoting Wikipedia data and starting discussions about domestic poets such as Koneski, Mateja Matevski or Jovan Koteski (1932-2001), who attended in 1964 and 1981, or publishing Macedonian translations of works by foreign participants, such as the Japanese Shuntaro Tanikawa, the French Pierre Béarn, and Russian Vadim Fedorovič Terehin (Ru.wikipedia). Journalist Vasko Markovski used his blog to publish a reportage [mk] on the park of poetry in Struga, where the trees planted by many world renowned poets grow side by side. Nami-Nami recommends places to eat out in Tallinn in Spring 2012. As of the end of the month of February 2012, the mobilization efforts of Internet users against the Anti-Counterfeiting Trade Agreement (ACTA) [en] were still going strong. In fact, they may have begun to bear fruit. By including infringements against the author's rights in its scope, this international treaty, which addresses intellectual property rights, also affects Internet content. The ratification debates which were placed on the European Parliament's agenda on February 29, were put on hold in expectation of the opinion of the European Court of Justice (ECJ). The issue of the treaty's conformity with European Community law was brought before the court on 22 February by the European Commission. Si l’avis est négatif, l’ACTA n’a plus aucune chance en Europe. Mais en cas d’avis positif, le recours à la CJUE représente le double avantage de redonner au traité une certaine crédibilité, et de repousser son adoption à une époque suffisamment lointaine pour que la polémique se soit tassée et que l’opinion publique regarde ailleurs. 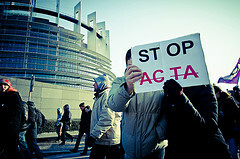 If the opinion is negative, ACTA no longer stands a chance in Europe. However, if there is a positive opinion, appealing to the ECJ would mean a double advantage by giving the treaty a certain credibility, and also pushing back implementation to a time that is far enough away when public debate has settled down and the public's attention is focused elsewhere. Les eurodéputés doivent résister à la stratégie de la Commission européenne, qui cherche à gagner du temps et à transformer le débat en une simple discussion juridique, et pour cela continuer à travailler au rejet d’ACTA. ACTA vise à imposer une tendance pour une politique globale du droit d’auteur qui est toxique pour l’Internet libre et pour les libertés. Le Parlement européen est le dernier rempart : il doit agir et adopter une position claire et forte, faute de quoi il laissera le champ libre à la Commission pour imposer une répression inacceptable. The Eurodeputies must resist the European Commission's strategy of attempting to gain time and turning the debate into a simple legal discussion, thereby continuing to work towards ACTA's rejection. 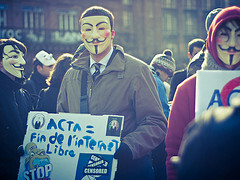 ACTA aims to impose a tendency for a global policy of author's rights that is toxic for the free Internet and for freedom. The European Parliament is the last line of defense: it must act and adopt a firm and clear position, otherwise it will leave the field wide open for the commission to impose an unacceptable repression. Les citoyens de toute l’Europe peuvent contacter leurs représentants dans les commissions Commerce International (INTA) et Industrie (ITRE), qui se réunissent cette semaine pour discuter d’ACTA, et leur demander de continuer à travailler au sein de leur commission pour le rejet d’ACTA. Citizens of all of Europe were able to contact their representatives in the International Trade (INTA) and Industry (ITRE) Committees, who met on February 29 to discuss ACTA. Many citizens requested their representatives to reject the proposal. The website of the European Parliament explains the procedure and the issues of the treaty [en] that are under scrutiny, and has published ‘What you should know about ACTA‘ [en], a page of questions and answers. The ACTA workshop of the European Parliament has been the object of a storify [en] made by the Parliamentary services (link via Global Voices contributor Asteris Masouras [en]). Nous sommes vraiment proches de la victoire — notre pétition forte de 2,4 millions de signatures a ébranlé les responsables politiques partout en Europe et stoppé les censeurs. La Commission européenne est à présent en position de faiblesse et espère que la Cour de justice donnera son feu vert au traité ACTA en lui soumettant une question juridique très limitée qui recevra certainement une réponse positive.Mais si nous faisons résonner nos voix aujourd'hui, nous pouvons faire en sorte que la Cour examine tous les impacts légaux du traité ACTA et publie un avis qui fera toute la lumière sur cette attaque contre nos droits qu'est ACTA. We are really close to victory — our petition, with 2.4 million signatures has shaken up those politicians in charge throughout Europe and stopped their censors. The European Commission is currently in a position of weakness and is hoping the Court of justice will green light the ACTA treaty by bringing before the court a very limited legal question, that will without doubt receive a positive response. But if we make our voices heard today, we will be able to get the court to examine all the legal implications of ACTA and publish an opinion that will bring to light the real attack against our rights that is ACTA. si certains se sentent l’âme d’un reporter- photographe en herbe, nous recherchons également des personnes pour faire un petit article photo du déroulement de la manif, rien de bien compliqué, comme fait ici pour Nice, Marseille,Bordeaux et Strasbourg. If any individuals see themselves as budding photojournalists we are also looking for people to do a small photo story on how the protest unfolds, nothing too complicated, as it happens in Nice, Marseille, Bordeaux, and Strasbourg. For details on the elements of the debate, see also these linked articles from the Tribune on February 29, and Myeurop, on March 3. On Global Voices, see the laws SOPA/PIPA that set a precedent in the USA, here [en] and here [en]. Since the beginning of the protests, ACTA seems to have lost a lot of political momentum. The title of this post is inspired by the end of the article “La liberté sur Internet : le filtrage de la discorde” which was published by the Institute of Research and Legal and Information studies and Communication (I.R.E.D.I.C.). It puts into perspective Internet blocking and debates the adoption of ACTA. The original article in French was published on March 4. For background on the ACTA proposal, more articles can be found here [en]. Kloty of Gedanken über Estland portrays [ger] Estonia's ambivalence over its historic past, as rumours and denials recur that the government wants to declare Estonians who fought in German uniform during the Second World War freedom fighters. Spotted by Locals: Experience cities like a local features a few dozen locations, including CEE cities of Belgrade, Bucharest, Budapest, Krakow, Ljubljana, Prague, Riga, Sofia, Tallinn, Vilnius, Warsaw, and Zagreb. A random sample post from Zagreb, Croatia: Hrelić Flea Market – The Aleph of Zagreb; from Bucharest, Romania: The Haunted House – Armenian Neighbourhood; from Sofia, Bulgaria: Nissim – A True Old-School Bookstore. Giustino of Ithing for Eestimaa discusses Estonians' obsession with language - and especially their own as opposed to Russian - against the backdrop of a recent interview with the country's president Toomas Ilves. Estonia: A Breivik of Tallinn? Giustino of Itching for Eestimaa draws parallels between the confused motives of Oslo killer Anders Breivik and Karen Drambjan and his failed attempt at attacking the Estonian Ministry of Defence in Tallinn on 11 August. Estonia: Defence Ministry Finances War Veterans? Kloty of Gedanken über Estland draws attention to [ger] information in Estonian media that the country's Defence Ministry is allegedly financing the controversial Waffen-SS war veterans' organizations. Axel Reetz of Estland blog discusses [GER] the consequences of the 2006 merger of Estonia's conservative parties, Pro Patria and Respublica, and how this union is now increasingly questioned, but also sees that unity within other parties in the country is dwindling. Giustino of Itching for Eestimaa reflects upon historical memory and guilt against the background of Estonian town Viljandi celebrating the 70th anniversary of Nazi occupation. Savva Terentyev, blogger from Syktyvkar who was accused of inciting hatred towards policemen in 2008, was granted a political asylum in Estonia, BBC's Russian Service reports [ru]. Terentyev decided to emigrate because he couldn't find job in Syktyvkar after the trial. “All the doors were shut for me due to my bad reputation,” Terentyev said explaining his motives, adding that he's not willing to return back to Russia. Kloty of Gedanken über Estland draws attention to [GER] a celebration of the 70th anniversary of Nazi occupation of Estonian town of Viljandi, and discusses how locals considered it preferrable to Soviet occupation, turning a blind eye to atrocities committed against the town's Jewish population during World War II. Edward Hugh of Baltic Economy Watch argues that Central and East European economies are more exposed to risk in case of a Eurozone crisis than what financial ratings say. Otto's Random Thoughts commemorates the 70th anniversary of deportations from Estonia, Latvia, and Lithuania following the June 1940 Soviet occupation of the countries, whereas Itching for Eestimaa reflects upon the political and social legacy of the deportations for Estonia. Giustino of Itching for Eestimaa reflects upon Estonia's changing politico-cultural identity against the backdrop of the 2011 Lennart Meri conference. From watching Russian television this week, you might think that the annual May 9 commemorations of the defeat of Nazi Germany in Lvov, Ukraine, were under siege from throngs of neo-Nazi, Ukrainian nationalists. Television footage showed hooded young Ukrainians attacking World War II veterans, giving Nazi salutes, and chanting nationalist slogans. 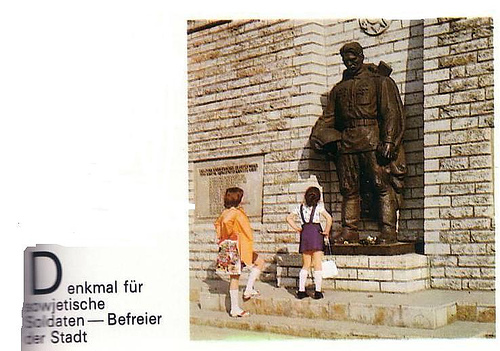 As they ripped St. George ribbons from people's shirts, it seemed that Ukrainian youth had forgotten the terrible sacrifices made by the Soviet Union to defeat Germany. Supporters of the right-wing Svoboda party and people wearing St. George ribbons clash during Victory Day celebrations in Lviv, Ukraine. Photo by Pavlo Palamarhuk, copyright © Demotix (05/09/2011). There are few historical events that evoke more passion across the vast space of the former Soviet Union than World War II. And for good reason. Even conservative estimates of the cost of the war are unimaginable: more than 20 million dead. In Russia, May 9 - known simply as Victory Day - is a day for Russians to honor the terrible sacrifices made to defeat Hitler's Germany in what is widely known as the Great Patriotic War. Indeed, for many Russians, these sacrifices represent nothing less than the simple and glorious triumph of good over evil. For people in regions caught between the Soviet Union and Germany, however, the legacy of May 9 is not so simple. In Ukraine, for instance, it is the day to remember the terrible sacrifices made during the war - as well as the day that ended Ukraine's hopes of independence from the Soviet Union. Indeed, Ukrainian nationalists had hoped to take advantage of the war to fashion an independent Ukraine. Since the disintegration of the Soviet Union, both the Russian government and some ethnic Russians still living in the newly independent republics have sought to defend the Soviet Union's historical legacy in the face of what they see as unfair historical accounts of Soviet imperialism. Nationalists, on the other hand, have sought to cement their position as independent nations in the face of what they see as Russia's neo-Soviet imperial ambition. This simmering tension reached the surface in Tallinn, Estonia, in 2007, when Russians openly clashed with authorities after the Estonian government announced that they would be moving a World War II monument known as the Bronze Soldier. Soon after, an unprecedented Russian cyber attack shut down the Estonian government. Not everyone regards Victory Day as a cause for celebration. In Western Ukraine, nationalist party members have violently disrupted a memorial service as veterans paid tribute to those who perished in the war . . . Unlike most of the post-Soviet region on May 9th, the western Ukrainian city of Lvov became a vicious display of neo-Nazism. Several thousand activists from radical nationalist parties blocked the entrance to Red Army soldiers’ cemeteries, preventing war veterans from getting inside and paying tribute. The clashes also fostered a wide-ranging debate on Oleg Kozyrev's blog [ru], after he posted a clip from Russian television detailing the events. In hundreds of comments, bloggers debated the meaning of the clashes. Were the clashes signs of a growing fascist, neo-Nazi movement in Ukraine? Or were they result of a small minority of idiotic Ukrainian ultranationalists? Во времена холодной войны между СССР и США кто-то из политиков (не помню кто именно) сказал: “Фермеру из Оклахомы и крестьянину с Поволжья ведь нечего делить. Поэтому им война не нужна. Она нужна политикам”. And that is perhaps the biggest untold story of these clashes: Mr. Kustov and the silent majority of Russians and Ukrainians in Lvov have little practical use for this big political game.